Here is a cool chess feature for all fans of Indian chess. 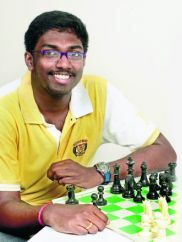 Recently, B. Adhiban qualified for the World Chess Cup, to be held in Norway from August 5, and the youngster is determined to make the opportunity count, writes P. K. Ajith Kumar in the Sports Star. In an interview after winning his fifth World chess championship, in Moscow last year, Viswanathan Anand was asked to name India’s most promising chess players. On top of Anand’s list was B. Adhiban. For those following the Chennai youngster’s career, it was hardly a surprise. He is a natural. He is easily one of India’s more talented kids on the 64 squares. He has won the World Under-16 championship and been part of an Indian team that won the bronze in the World team championship. Recently, Adhiban, 21, qualified for the World Cup, to be held in Norway from August 5. He made the cut from the Asian championship in Manila. He was placed fifth in the tournament when the tie-breakers were applied; on points he was ranked second. He had 6.5 points, half-a-point behind the champion, Li Chao of China. It is this desire to win that set him apart from most of his contemporaries, as an upcoming talent. It was refreshing to watch a young Adhiban, still at school, playing imaginative chess, game after game, always wanting to win. His rise was meteoric after he won his first National title, the Under-13 championship in Kolkata in 2006. He won the silver in the Asian Under-14 championship in Iran that year. The following year he became the Asian Under-16 champion in Uzbekistan and helped India clinch the gold at the World Youth Olympiad in Singapore. Then in 2008, he won the World Under-16 title in Vietnam. He was also the National ‘B’ champion that year, his first success in the senior men’s event. A year later, at 17, he won the National ‘A’, rechristened as National Premier, in Mumbai. Then in 2010, he became a Grandmaster. He had secured his third and final Grandmaster norm from the Olomouc International tournament in the Czech Republic; he had won the round-robin event, something no Indian had done for quite a while. Later this year, Adhiban’s hometown will host the World championship match between his idol Anand and Magnus Carlsen of Norway. “It is great that Chennai is hosting the biggest event in chess,” he said. Adhiban wants to prove Anand right. And he has the game to do it. He a talented chess player for sure. Nice kid. India does have a huge storehouse of chess talent that needs to be tapped.